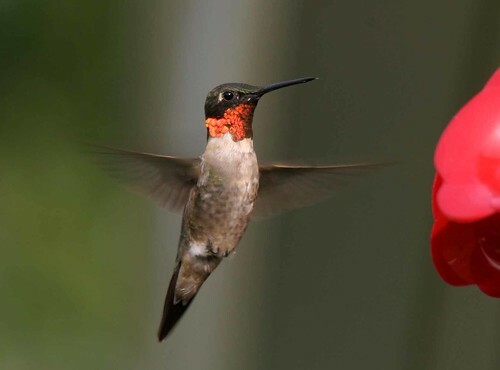 While some look to their gardens for signs of spring and summer, I look to the hummingbirds. I follow the hummingbird migration maps, and determine when they will return to their favorite tree on our property each Spring. 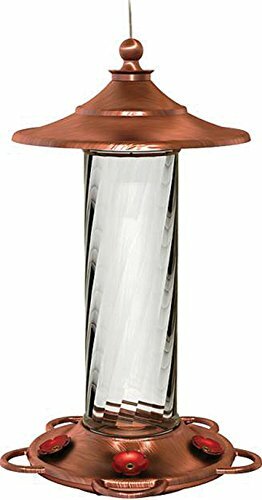 My hummingbird feeder goes out early in the season so that it is ready for the first arrival. And then, late in the summer, I know that soon they will leave and move to warmer regions. The feeder is emptied later in the season at a much quicker rate because now the young have grown so there are more "hummers", and because they are eating a lot to gain energy for their flight south. But feeding them by hand, that is a heartwarming treat that allows you to look at them up closely. 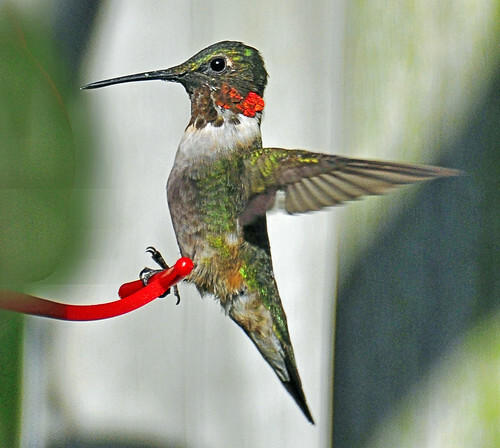 I hope to share with you how to feed hummingbirds by hand, and a place or two where it is a very popular thing to do. We never thought we would have as many hummingbirds as we do at our feeder here in Northern NJ. When we first moved into our home over 30 years ago you rarely saw them...but you never saw bears either, time changes things and now we see both. 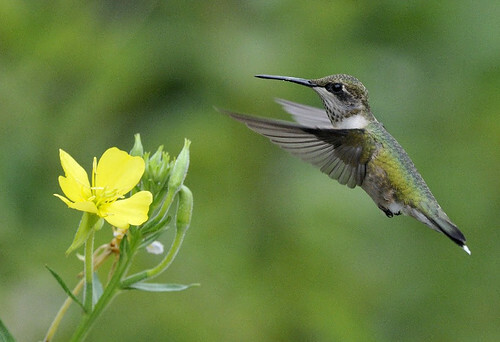 In our part of the country the only variety of hummingbird that we have is the Ruby Throated Hummingbird. 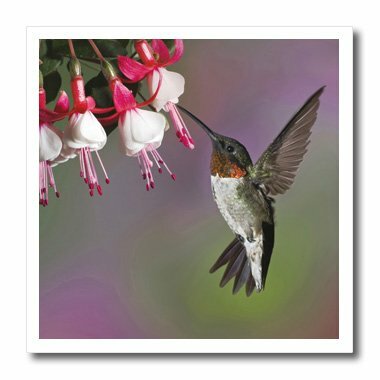 I learned to love hummingbirds when we were out west staying in Arizona for an extended period of time due to a business trip my husband was on. Numerous hummers would come to our feeder at one time, there never seemed to be a moment when there were no hummingbirds. 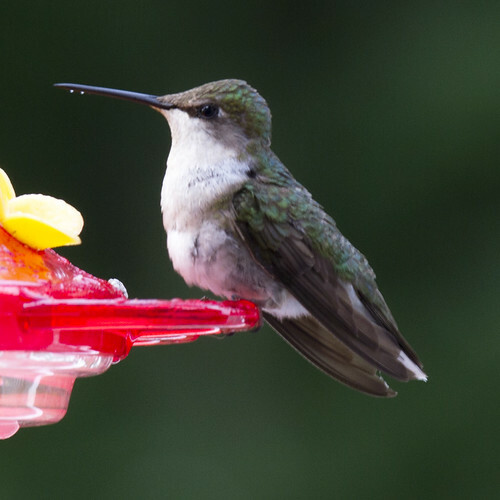 Another year we were in Colorado at a beautiful location for the night in the outdoors, and the people we were visiting showed us that if you put your fingers on either side of the feeder, the hummingbirds would land on your fingers like a perch while they ate. All of us tried it successfully. But actually getting them to come and eat from your hand like the picture from bird feeders.com takes patience. I love this site, by the way, as it has one of the nicest Hummingbird Migration Maps that I've seen where anyone can post their sightings. (I have no affiliation with the site). 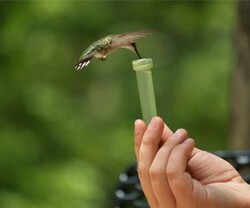 At Lake Hope State Park in Ohio in July and August there is a program devoted to hand feeding the local hummingbirds. They teach you how it's done. It looks like they use the little things that I have removed from the bottom of the stem of single red roses my husband has given me. I've never saved them before...the next time he brings me a rose I just may be more excited about the little thing on the stem (I don't know what they're called) than the rose. Enjoy the beautiful video above, you'll get the idea of how it's done. These hummingbirds are very familiar with taking food this way, I'd have to "teach" ours, but I don't think it would take long. Mix the right proportion of suger and water...that would be roughly 1 part sugar to 4 parts water. Find the right kind of feeder. Actually, you could just sit and hold the feeder you are using right now. I'm thinking of trying that tomorrow. When I go out to fill the feeder, I am close to assaulted by hungry hummingbirds buzzing so close to me I can feel the wind from their wings. I'm sure if I sat down holding the feeder, they would eventually come and eat from it, if I'm very quiet and very patience, because this would be a new thing for both of us. I expect the young hummingbirds born this year to be the most daring, they have "grown up" seeing me every day of their life. 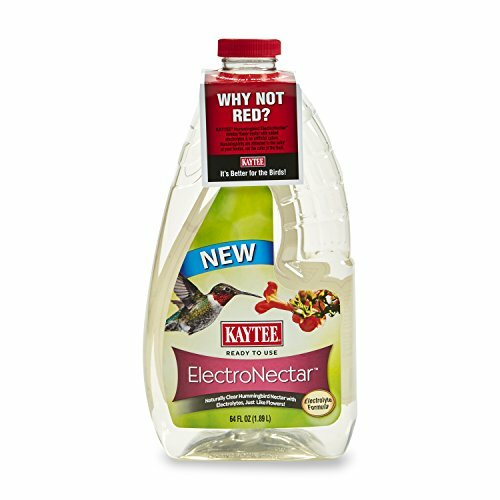 I'll let you know how it goes when I try it. You can go ahead and try one of the flower stem/bud holders with some red wrapped around the top if you want to use something smaller, or a very small, clean glass vial or bottle with something red wrapped around the top. I think I will start with the feeder they are accustomed to, then move on to something smaller. You could hold your smaller feeder near the one they are used to if you like and see if that will draw them. Be very patient and quiet, no sudden moves, no sudden noises. My son was visiting and helped us catch it. It was amazing to have this little creature sit so still on my hand. @MBC I'll have to stop by and visit your article, I can't believe you commented in January and I missed it! Love your photos. 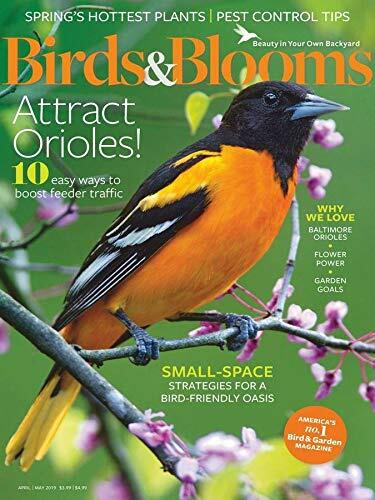 I also have an article on Hummingbirds. They are so fascinating! @DerdriuMarriner this is a good observation that you have made. happynutritionist, It's also charming to realize that generations are returning to the same feeders and backyards. The continuity of parents passing on to their offspring, who pass the info on to their offspring, etc., the tradition of visiting specific feeders attests to the intelligence and loyalty of birds in establishing familiarity in their lives. Bird parents want their offspring to feel safe. That is how I feel about it, and you are right, they do come back, those with unique markings I can recognize. The babies are at the hummingbird feeder these days which always makes for a lot more chasing one another. happynutritionist, Birds can be such welcome guests in our lives. It's fun to think that, since they often return to the same feeders and backyards, they look forward to annual reunions with us as much as we look forward to their return visits. Thank you, I am looking at one out my window now and realizing it will only be a matter of a week to a few weeks before they migrate away for the winter, the food is going down fast and I have to fill the feeder again. What wonderful photos you have here! 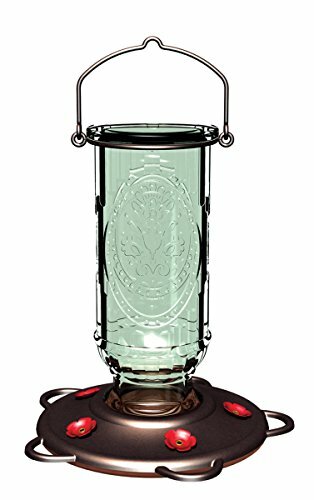 I love hummingbirds and use that Perky Pet feeder. I seldom see more than one hummingbird use it at a time. They are always chasing each other away. Growing Shamrocks is a fun and easy project to do with the children, or for your own pleasure to decorate for St. Patrick's Day or add to the garden. The annual National Cherry Blossom Festival includes a parade and the presentation of the Cherry Blossom Queen. Learn what not to do by our funny unexpected experience.